Senator Duane also offered congratulations to Tishman Speyer Properties and said, "I welcome Tishman Speyer as a partner with the MTA, the City and the State in creating a world-class development for New York City, New York State, the West Side of Manhattan and the immediate surrounding neighborhoods, as well as transit users who will benefit from the capital plan which the development will help fund." Senator Duane commended the MTA for moving the selection process forward in a timely manner, and for having made the process open to and inclusive of the community to the greatest extent possible while being fair to the parties that were bidding. "I look forward to continuing with this open process," Senator Duane said, noting that now that a developer has been selected, the coming months hold more negotiations, including the City's Uniform Land Use Review Procedure (ULURP) for the Western Rail Yards. "Going forward, during these challenging economic times, I and others will continue to work to increase the amount of affordable housing for all income levels and, especially, to find a way to make it permanent," Senator Duane said, commenting that he will work on the issue with Community Board Four, which has labeled permanent affordable housing a prime concern along with preservation of the High Line. 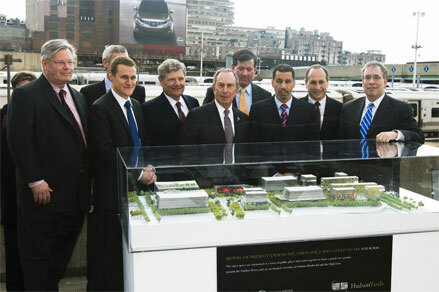 In addition, Senator Duane stressed that, "I have long been a champion of the High Line and preserving it in its entirety. It's good for the City and good for Tishman Speyer, and I look forward to continuing to work to make sure the High Line realizes the amazing potential I know it holds." Senator Duane also pointed out that the MTA's selection of a developer provides an opportunity to examine the makeup of uses on the Rail Yards. "Residential and commercial development must both play a significant role on the Rail Yards, and we need to look at the ratio of one to the other. As we look at the configuration and makeup of the site, we will also consider the location and specifications of the cultural center, space for nonprofit arts groups, and, critically, the school, all of which are to be included onsite," said Senator Duane. "Together, the design and uses will impact the quality of life of the West Side and surrounding neighborhoods, drive the City's future growth and ensure the future fiscal integrity of the MTA." Finally, Senator Duane said, the context of the Rail Yards' location within the larger City will continue to be examined. "The Clinton/Hell's Kitchen and Chelsea neighborhoods are mixed-income, low-rise gems, and since the Rail Yards straddle the two communities, we look forward to working with all the stakeholders to make sure that their integrity is respected." Senator Duane also stressed the importance of examining the Rail Yards' relationship to Hudson River Park to the West and the proposed Moynihan Station to the East to ensure comprehensive and sensitive urban planning. "This has been a very exciting process, and I am pleased that the public had a chance to review the competing bids, all of which were of world-class quality," said Senator Duane. "I look forward to the coming months as the MTA, Tishman Speyer and all the stakeholders continue to work together and plan together for this important site on Manhattan’s West Side."